Did you see how sad Thor was when Hela broke Mjolnir in Thor: Ragnarok? The big lug almost looked like he was going to break into tears for a moment as he lamented the loss of his beloved hammer. We thought he would never find a new weapon to replace it… but we were wrong! Just look at his brand new weapon, Stormbreaker, from Avengers: Infinity War. The spicy new weapon is an axe and hammer combination that seems to be acting as a fine substitute for the mighty Norse thunder god. In fact, we’ve been itching to get our hands on the brand new axe of his… a toy version that is! 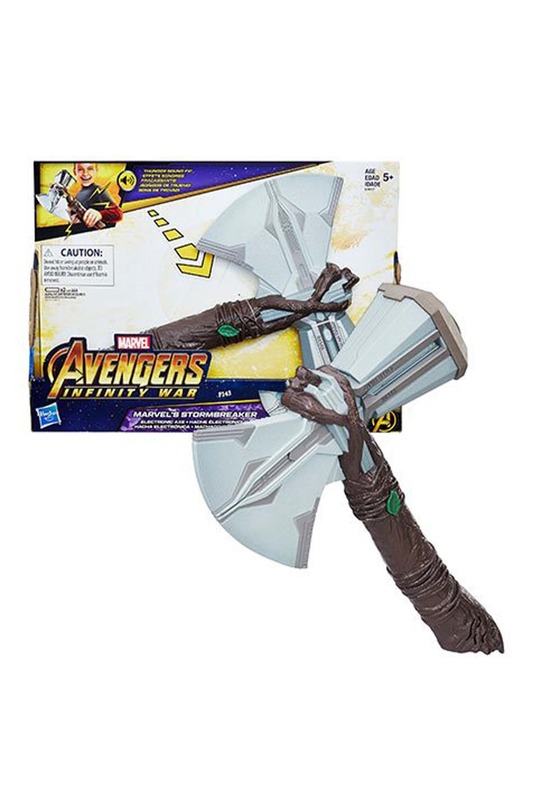 This Avengers: Infinity War Stormbreaker Axe is an officially licensed toy from Marvel’s latest movie in the Avengers series. It’s designed to look just like the weapon wielded by Thor and with a simple press of a button, it makes sounds from the movie. You can swing it around and almost feel the mighty power of thunder coursing through your veins (almost). Be sure to pair this up with one of our Thor costumes to get the authentic look of an Asgardian warrior! You may even feel tough enough to go a few rounds with Thanos.